The Nootka cypress with its long sweeping branches and drooping foliage is the exact opposite in appearance to the Mediterranean cypress (Cupressus sempervirens). The dense blue-green foliage almost completely hides the beautiful cinnamon-coloured bark, which peels from the trunk in long strands. On hot days, the trees give off a strong smell, sometimes described as “like a pencil”. The Nootka cypress grows in mountains near the west coast of North America. In the right spot it can achieve a height of 40m and live for over 1000 years. During the last century the species has apparently suffered from the effects of climate change, alarming numbers having died in its native habitat. 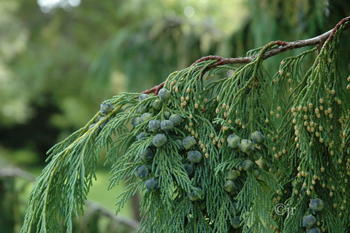 Nootka cypress was brought to Europe around the middle of the 1800s. Nowadays it is available from nurseries in about a dozen named varieties of form and colour. It is the hardiest of the cypresses and is grown – though rare – in the south of Finland. At Mustila, it is at the extreme limit of its hardiness. In the most suitable spots it has developed into tree form, but otherwise has remained shrubby. Even on the larger trees, it is clearly visible that they have lost their needles for about half a metre above the snow line in the coldest winters.